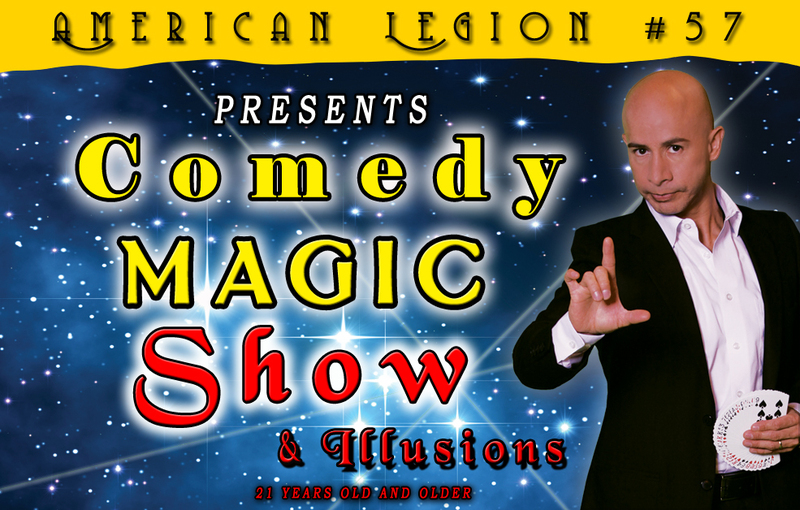 Comedy Magic & Illusions Show in Lake City, Fla. Hosted by American Legion Post 57. Enjoy a dynamic, interactive Comedy Magic & Illusions Show with family and friends. Event in Lake City FL.! Event Location: American Legion Post 57 2602 SW Main Boulevard, Lake City, FL. Price: $15 in advance and $20 at the door. AGES: 21 and up ONLY. Magician Cesar Domico: “It is always an honor to perform for veterans and their families. I love to bring my shows to them and make people laugh, surprising them not only with tricks and funny situations, but also by showing the power of the mind through fun demonstrations. Come to see an Amazing Comedy Magic & illusions Show by international Comedy Magician Cesar Domico! - Lake City, FL. With over 25 years of experience performing magic shows on stage, Cesar Domico will bring his award-winning sleight-of-hand and dynamic act to Lake City, Fla., on June 15 at 7:00 pm. You will be dazzled by Cesar’s vibrant show – full of his unique humor and high energy as he pulls off mind-boggling tricks amid side-splitting situations that involve members of the audience. This hilarious show is guaranteed to leave everyone spellbound and mesmerized! Support your local American Legion #57 - Event - while enjoying a fun day with family and friends. The Event is for adults over 21 years old. Get your tickets for this event by calling the America Legion Post 57 at (386) 752-7776. A full bar and the kitchen with “bar snacks” open at 5 p.m. The kitchen will close at 6:30 p.m... and be ready for the show! Is located in Columbia County, near the intersection of Interstate 75 and Interstate 10, about 61 miles west of Jacksonville and 105 miles east of Tallahassee. About the legion 57 - Lake City, FL. From the website: Since our charter in (1920), our American Legion Post has been welcoming VETERANS from all branches of our Armed Forces. Today, we continue to welcome all military personnel serving our country. Joining our Post enables you to continue serving your God, Country and Community. Our mission is to implement the goals, aspirations, dreams, peace and blessings for our country, friends and families embodied in our preamble below. To the wonderful patriotic citizens of the Lake City community. Join our Post as a Booster or Sponsor. (click Sponsor or Booster Button for details). 100% of the monies raised are given back to the community. Help us to continue sponsoring Scholarships for our children; give aid and assistance to our local needy Veterans, and their families. Help us to continue to support financially worthy community programs and projects.